Seasoning a bowl of noodles is a personal affair. 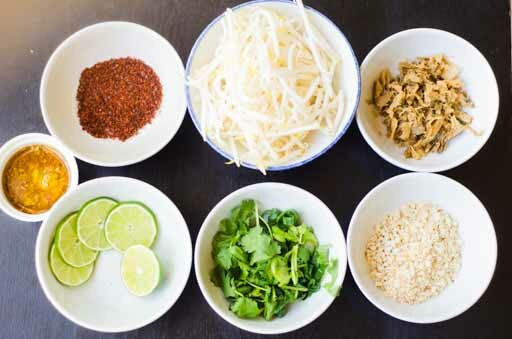 Given a good base or broth, you tweak your noodles with condiments until you find the right spot. Some people love it extremely hot and some people have it the way it's served. Add the broth the last minute because the noodles will start absorbing the broth and get bigger. And eventually, all the broth will disappear. Substitute cilantro stems for cilantro roots. Make the pork soup (reicpe below -takes 1 hr to make). Let the soup simmer and keep the lid off. Mince the cilantro root and garlic together. 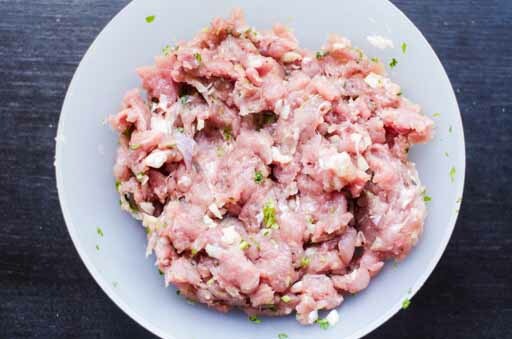 Add them to ground pork. Add a dash of ground pepper and salt. Massage the spices into the ground pork. Add the pork meatballs (from the package picture 3) to the simmering soup. 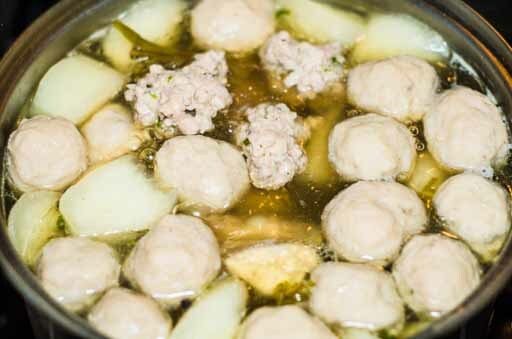 Make ground pork balls (any size or even patties) and drop them in the simmering broth. When everything is cooked, add ½ tablespoon of salt. Taste to see you like it. 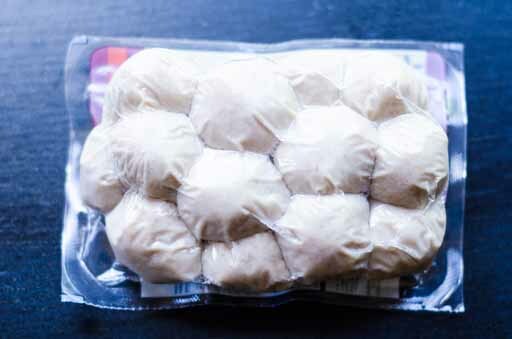 Do not add too much salt because you’ll be adding the salty preserved Chinese cabbage as a seasoning. If needed, at the table you can add fish sauce. Toast the peanuts in the pan, if you have raw peanuts. It should take about 7-10 minutes in the oven at 400 degrees for large peanuts. Adjust the time according to the size. Or you can toast them in a pan. 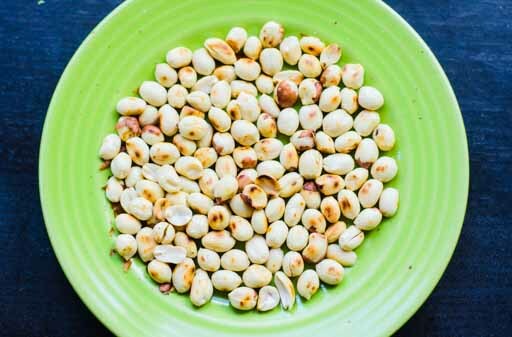 When the peanuts are ready (picture 5), let them cool, then coarsely grind them either in a mortar and pestle or a food processor. 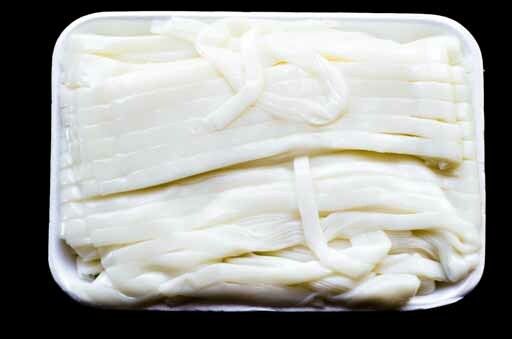 If your noodles have been in the refrigerator or freezer, warm up your noodles in the microwave until soft and warm. Then, separate the noodle strands. 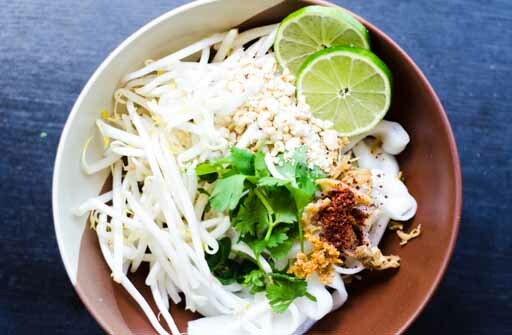 One pound of noodles can make 4 to 6 servings. Add the noodles to the serving bowls. 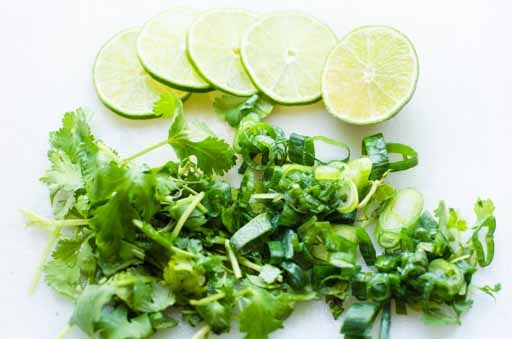 Chop cilantro and green onions into 1/3 of an inch. Slice lime crossectional, 1/4 inch thick. Add the bean sprouts into the serving bowl, next to the noodles. Top with chopped cilantro and green onions. 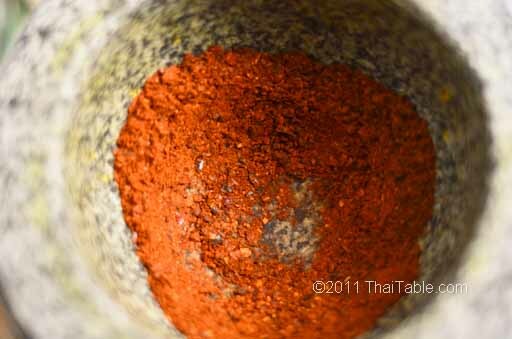 Add ground peanuts, salted cabbage, fried garlic, lime and chili powder. Sprinkle white ground pepper. Squeeze a wedge of lime on top. 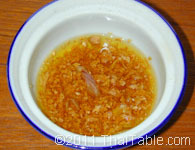 Put sugar, fish sauce and additional chili powder in bowls to serve on the table as condiments to the noodle soup. When you’re ready to serve, add the hot broth with meatballs and ground pork to the bowl. The noodles will keep absorbing the broth, do not let the noodles sit in the broth for a long time. Some people like daikon and pork ribs in the bowl but others leave them in the pot to season the broth. Have it however you like. Keep the lid off the pot the whole time. This lets it simmer gently and you can see the progress. Hard boiling will make the soup cloudy. Pork bones and daikon together form a natural MSG. 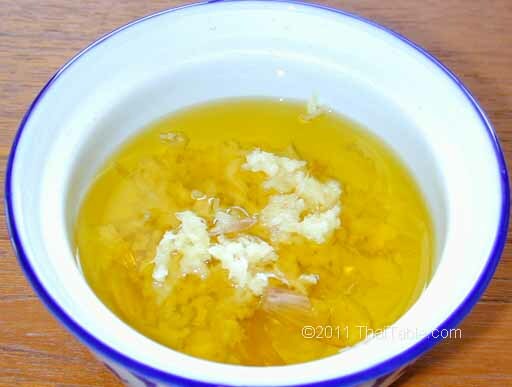 You can taste the umami flavor of the broth after a long boiling period. If you want more flavors, add more bones, spareribs and pork ribs. This broth is perfect for a soup base. You can substitute cilantro stems for cilantro roots. Fill a 4-quart pot with water up to ¾ full. Let it boil while you prep other ingredients. Rinse the pork ribs well in cold water. Peel and chop daikon into large pieces. 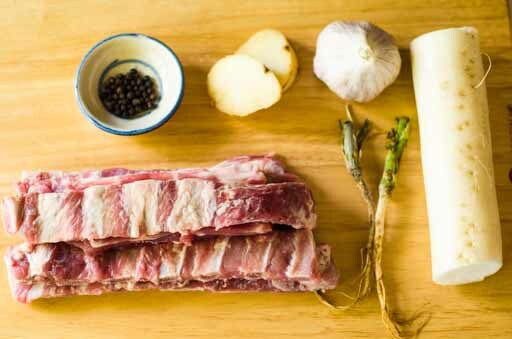 Drop the pork ribs into the boiling water. Add the rest of the ingredients except salt. Do not cover the soup with a lid. Let the soup simmer for at least 1 hour. Add more water as needed to bring the soup level back up to the same level. At the end of the hour, add salt. The desired color is bright red or orange. The trick to get this color is to toast the peppers without burning them. If you go over the edge, burnt pepper will make the ground pepper dark. 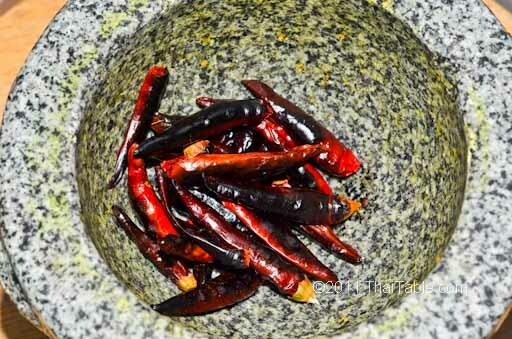 Use dried Thai chili peppers for maximum heat. 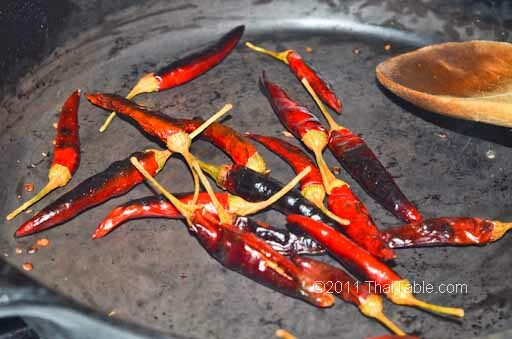 Toast the dried whole chili peppers with stem on in a hot pan. A cast iron pan is best for this job because it gives even heating. Use medium heat. Keep stirring to get all sides toasted evenly. When your peppers start to fragrant and turn dark, they are ready. Take extra care not to breath in deeply the hot aroma, it will burn your lungs! Remove from heat and let them cool before grinding. When cooled, they are crunchy and easy to grind. Remove the stems and grind them in a mortar. Pound the chili peppers until fine. 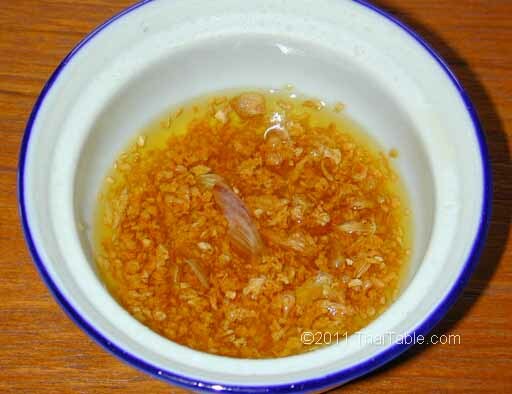 Once in a while, drag the pestle in a circular motion or back and forth to break up clumps. This should make about 2 tablespoons. Keep the ground chili pepper in a jar in the pantry for up to a year. After a year, it tends to lose it potency.